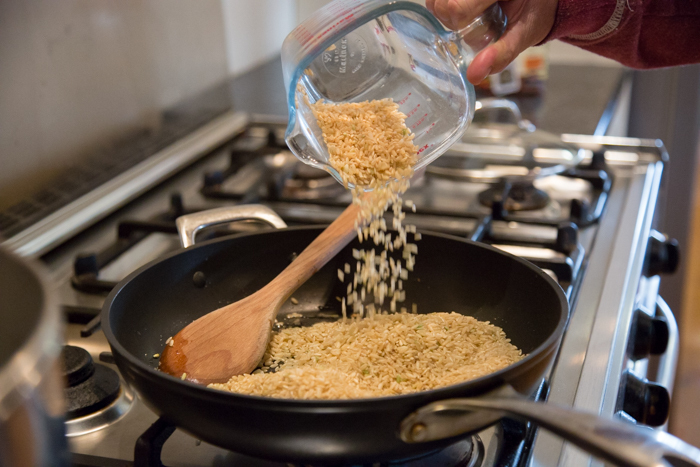 This recipe was sent to me by Poh, my new BFF – where BFF status is based on a dodgy forty minute video link up between us and five other people. But hey, I decided Tracey was the one based on less interaction, so totally within type. 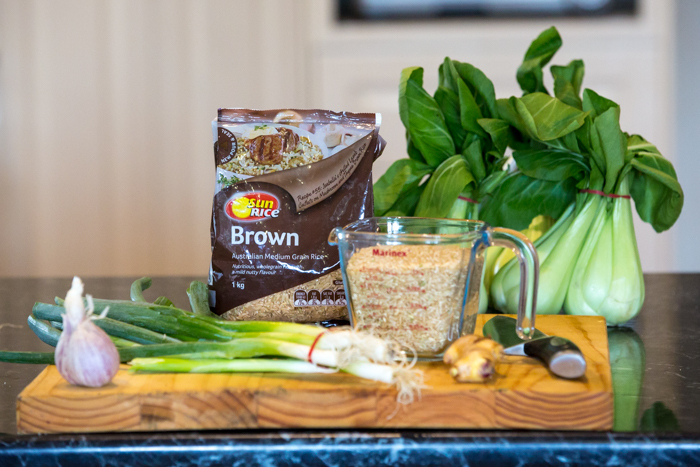 This post isn’t a sponsored post as such, but I wanted to share the recipe anyway and felt odd about not including the fact I’ll be working a little bit with Poh and Sunrice over the next couple of months, which is really exciting. Sometimes I don’t have the energy for cooking anything fancier than spag bog, but when I have the giveashitness there really isn’t anything I’d rather do. I love to trying new recipes. I love cooking in general. I really, really love eating and feeding my family stuff they like. This recipe was different for a couple of reasons. One, brown rice. 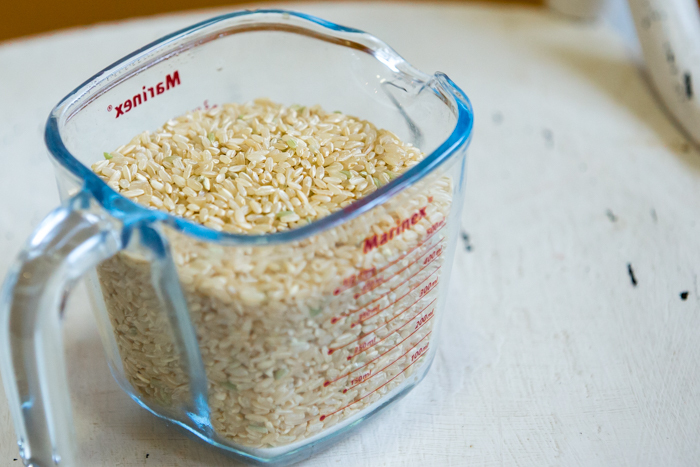 Two, the method of cooking the brown rice. Three, the oil bit with step seven. 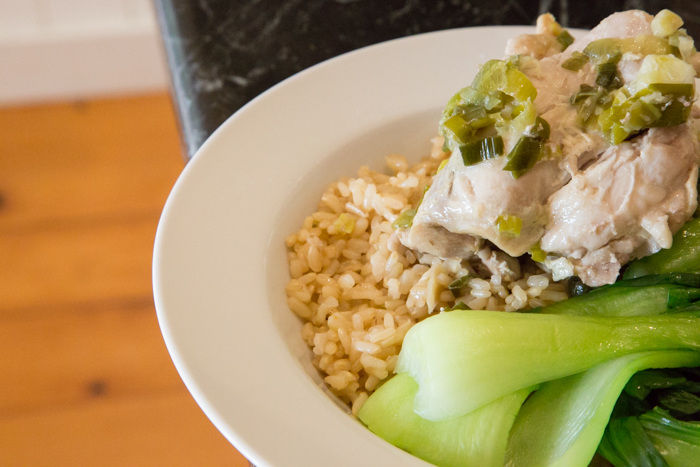 From their part, the kids demanded white rice with the chicken, meaning I got to have leftovers the next day – which is also a favourite thing I love. This isn’t a reflection on the rice, which was delicious, so much as our kids not being especially adventurous with their tastebuds. But they had some and who knows, maybe next time. Meanwhile, here’s this wonderful recipe my friend, Poh, gave me. I hope you give it a go and like it too. 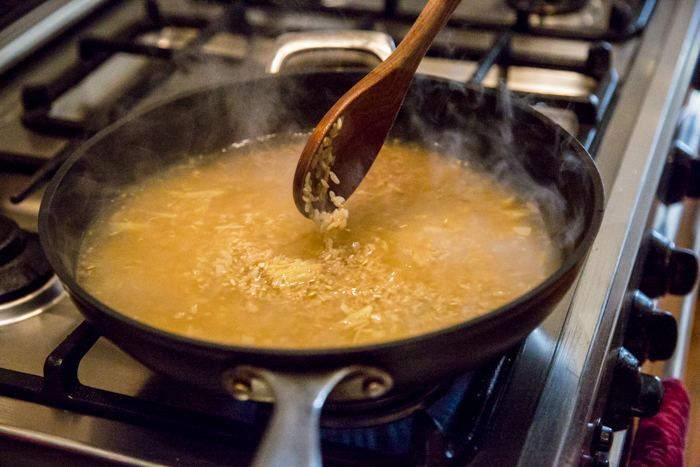 STEP ONE: Combine the oil, garlic and ginger in a non-stick saucepan. 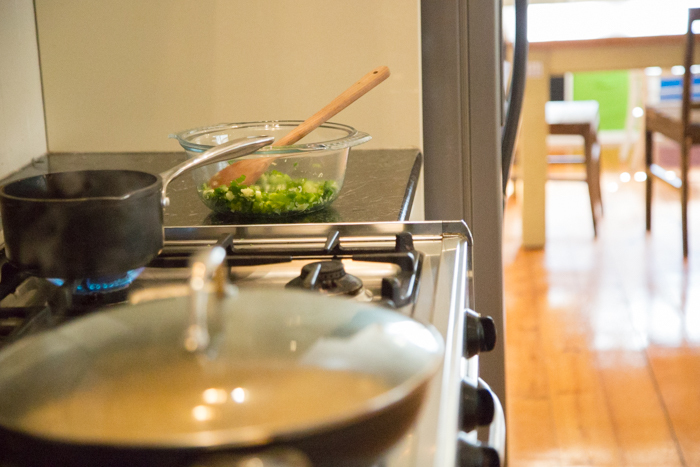 Saute until golden and fragrant. 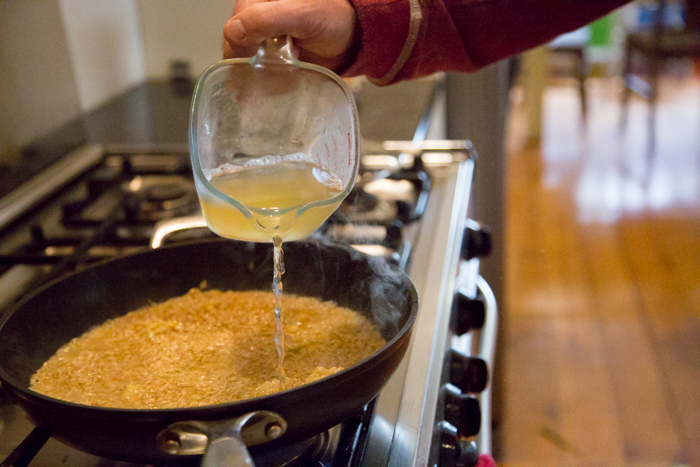 STEP TWO: Add the rice and toast until the rice is coated with oil. STEP THREE: Add the stock. Bring to the boil, reduce to a simmer, cover and cook for 20 minutes. STEP FOUR: Remove from the heat and allow to sit for a further 10 minutes before fluffing up with a spoon. STEP SIX: Combine the spring onion, ginger and salt in a medium mixing bowl. 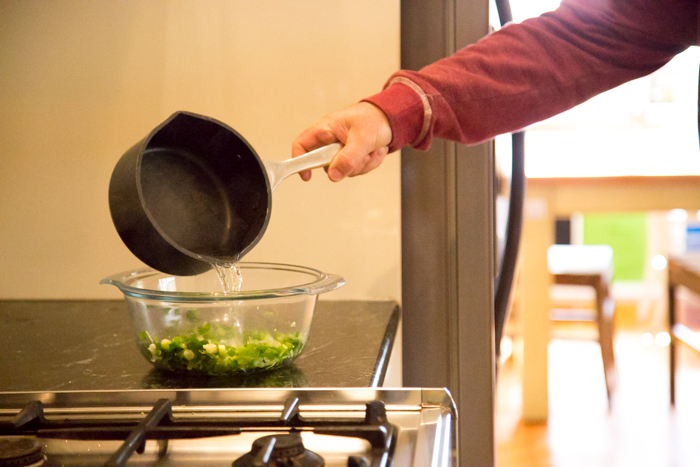 STEP SEVEN: Heat the oil in a small saucepan until smoking, then carefully pour this over the spring onion, ginger and salt. This will spit aggressively so stand back. 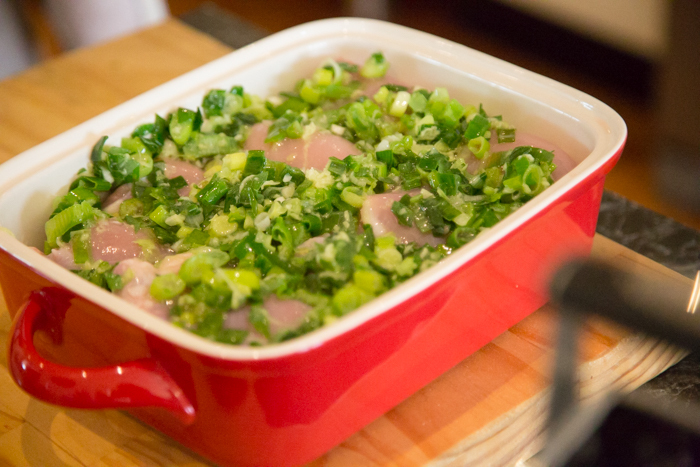 STEP EIGHT: Place all the chicken in an oven proof dish preferably with a lid, (otherwise cover tightly with foil) then spread all the green sauce over the meat. STEP NINE: Cover and bake for 15 minutes or until the chicken is cooked through. I don’t know what I did wrong, but it took me 30 minutes for chicken to be cooked. 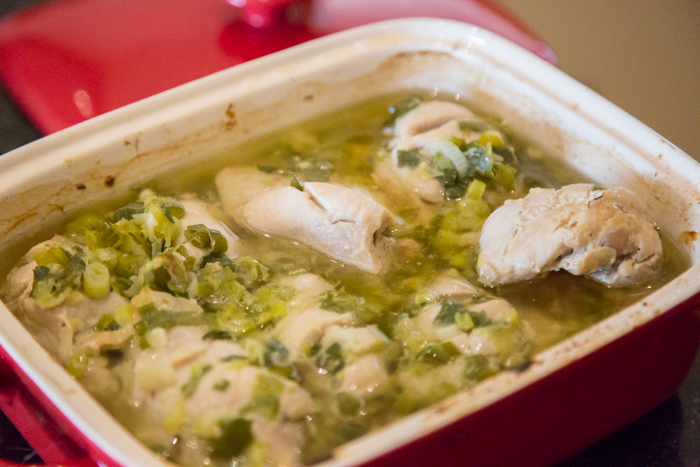 STEP TEN: When chicken is about done, blanch boo choy with boiling hot water for 1 – 2 minutes, drain. STEP ELEVEN: Plate up, remembering to save the best looking servings for the judges. STEP TWELVE: Be sure to include the phrase, “My friend, Poh, who gave me this recipe,” in any and all dinner conversation topics. 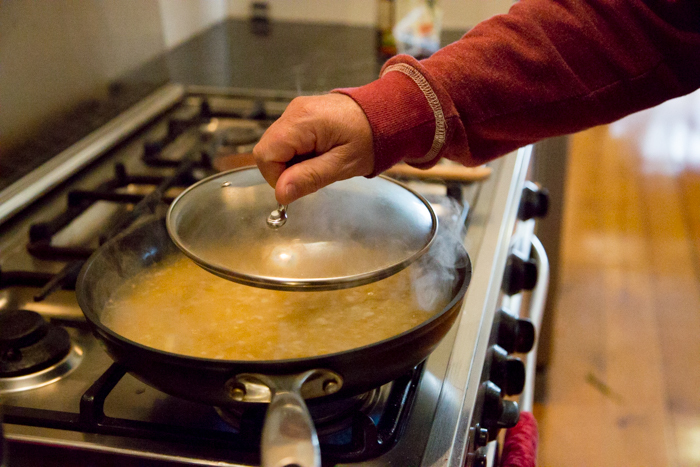 Put garlic, ginger and oil in a saucepan. Reread step. 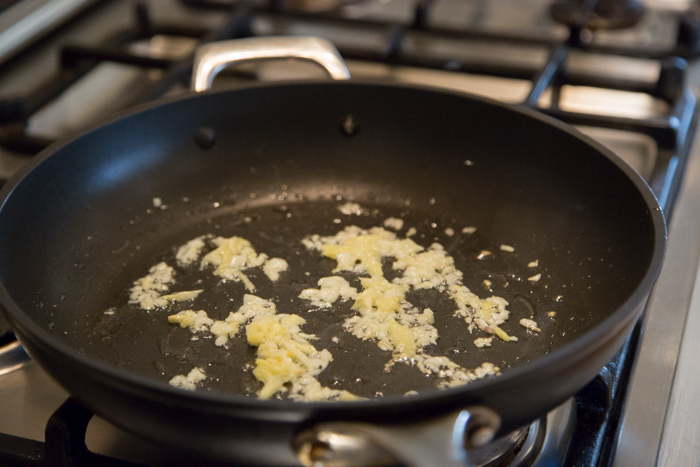 Move garlic, ginger and oil to non-stick pan. 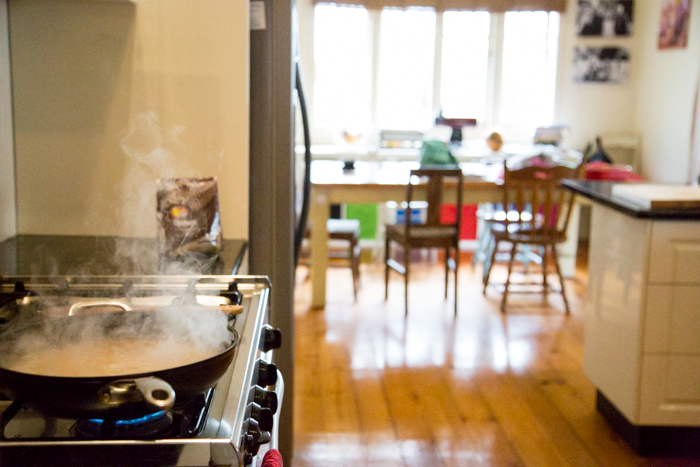 Leaving it at this point was hard because I’m used to making risotto which, if you glance away for even a moment will reward you with disaster. Arty shot with steam. I wasn’t allowed to be in it. 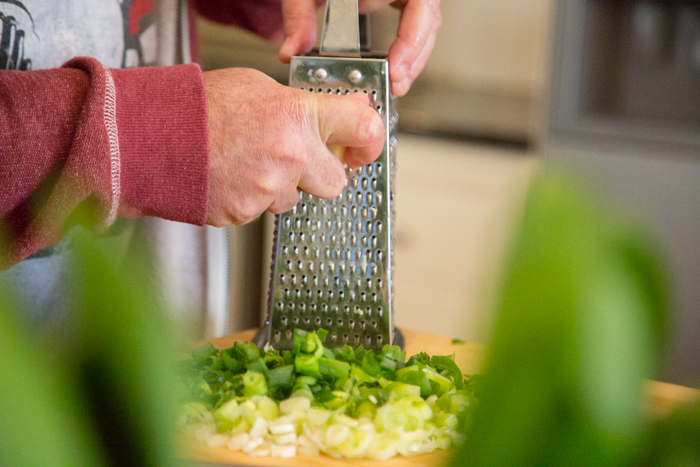 The key to good grating is keeping your fingers out of the way. Correctly sized lid on rice. Green bits chopped and oil heating up until steam rises from the pan. Anytime you need help on that show of yours, Poh, I’m available. 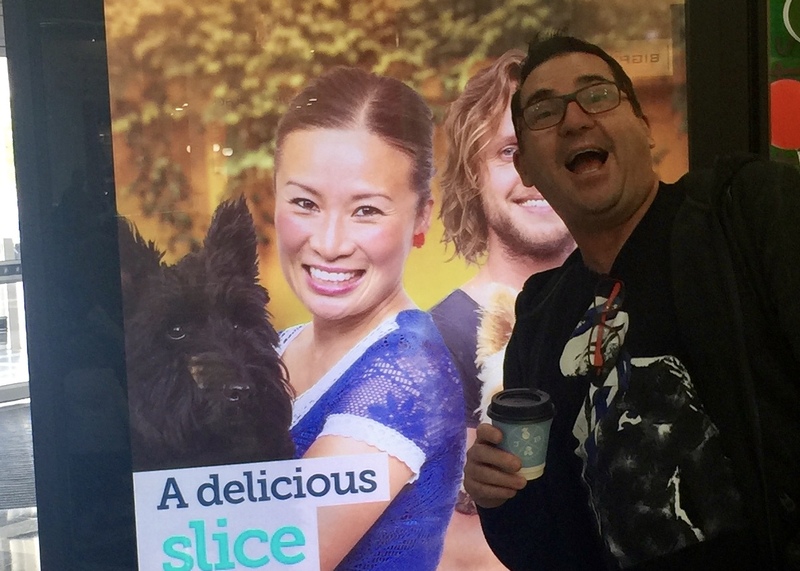 Tracey didn’t ask me to remove myself from this photo, I just took Poh’s advice to beware of oil splattering very seriously. 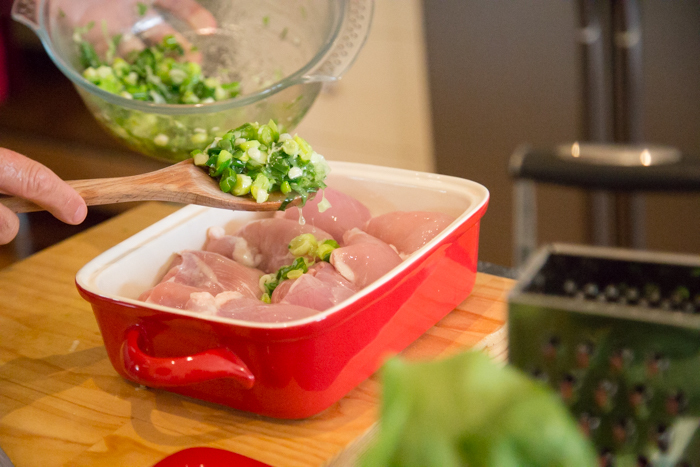 Spooning green mix onto the chicken. This was the point at which I realised I hadn’t scored the chicken fillets, meaning I had to remove the whole thing. The next shot wasn’t as pretty, so isn’t included. 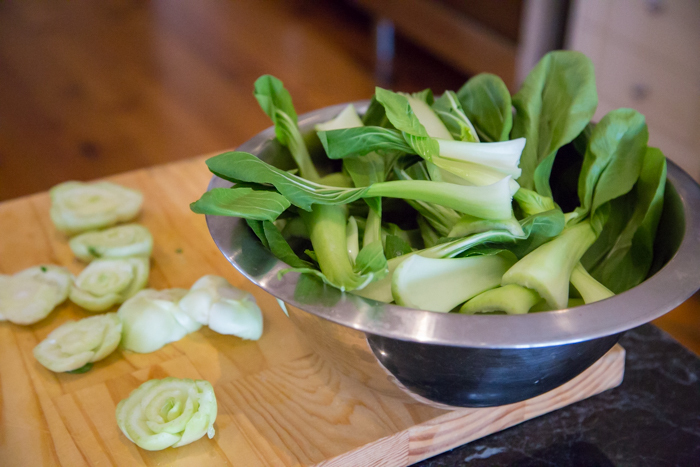 Eight heads of Pak choy, ready to be blanched. I’ve never seen so many greens on my bench at one time. 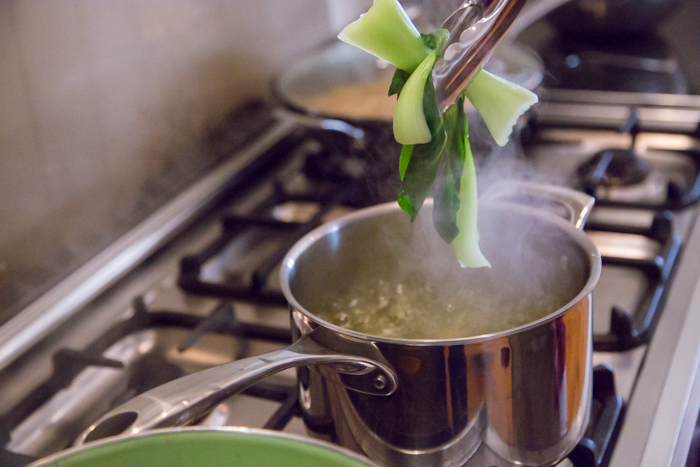 Blanching like a pro. Note: now I want to know why people used to name their girls after a cooking process whereby you dunked something into hot water until it wilted. Odd. I don’t know what it was supposed to look like, but I’ll say this – mine tasted much better than you’d think from this photo. A lovely meal which tasted even better heated up the next day. Or maybe I was just getting used to the brown rice. The kids added a little soy sauce. Except for Miss4. I’m so jealous you got to meet Pho albeit via video link. She’s so fab. 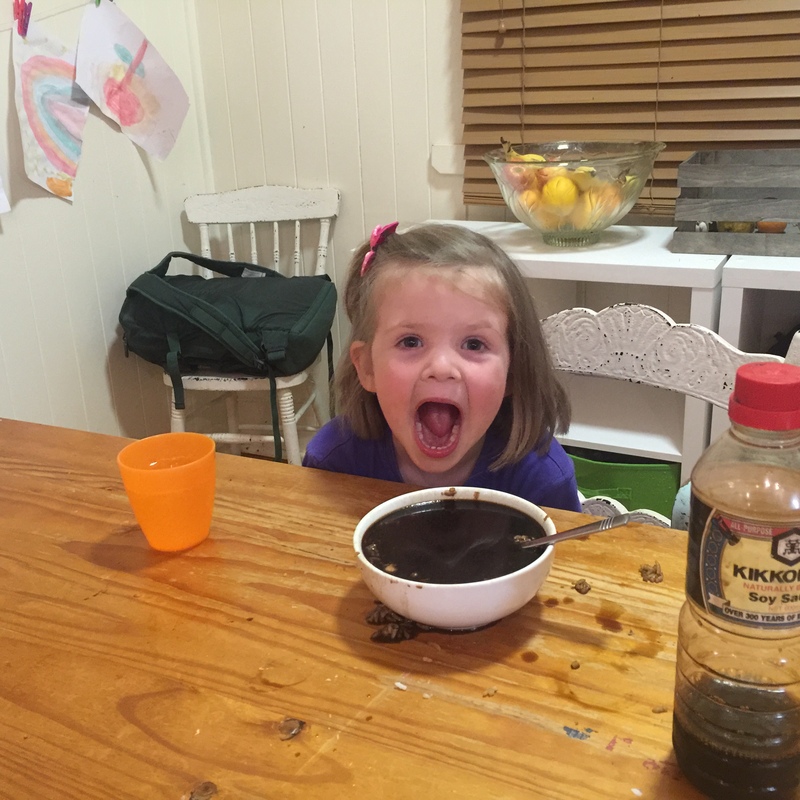 Laughing my head off at miss four. Last time I tired sunrise it was a ghastly chalky substance compared to other brands, have they improved ? I might give their brown rice another try. Tres embarrassment I meant Poh of course. I have soup on the brain obviously. YUM!!! We lived in Singapore so I love chicken rice. Brown rice is so good, I much prefer it now. In at home cooking anyway. Looks good! I’ll have to give it a go.